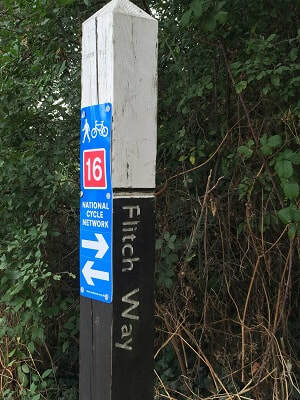 The Flitch Way forms part of National Cycle Network Route 16 which stretches from Birchanger to Great Totham. Type of route - Quiet roads and the Flitch Way traffic free path. Route 16 starts at the intersection with Route 13 at Birchanger near Stansted. The route heads south east on bridlepaths from the village of Birchanger near Stansted to join the Flitch Way traffic-free railway path. The route follows the disused railway path along the northern edge of the ancient royal hunting grounds of Hatfield Forest, through Takeley (intersection with Regional Route 50) until Great Dunmow where it deviates through the town centre before re-joining the Flitch Way using a local byway. The Flitch Way finishes at Braintree Station and the route heads in a generally southerly direction mainly on cycle paths or quiet roads through Great Notley to Witham and then to an intersection with Route 1 near Great Totham where the route terminates. You can find out more information on Route 16 here. ​The off road Flitch Way section was surfaced in 2005 with a £900,000 grant from the Office of the Deputy Prime Minister with an additional £250,000 coming from Sustrans. This was done as a joint venture between Essex County Council and Sustrans, with input from BAA, Braintree District Council, Uttlesford District Council, Go East and the East of England Development Agency. Click here to download circular cycle routes and information which includes the Flitch Way. Route 16 has two Millennium Mileposts at Rayne Station and at Great Notley. They were two of the 1000 Millennium Mileposts made to mark the creation of the Sustrans National Cycle Network. Funded by the Royal Bank of Scotland, they can be found along the main cycle routes throughout the UK. Four different post designs were commissioned from four artists representing each country of the UK. This “Fossil tree” design is by English artist John Mills and takes the form of an abstract tree. Inspired by Sigillaria, an extinct tree-like plant with a tall, occasionally forked trunk, whose fossils are commonly found in Carboniferous deposits. The post features imagery of fossils depicting the passage of time from early primitive creatures to the ultimate demise of fossil fuel driven technology. It was cast by Taylors Foundry in Haverhill. This post was designed by Welsh artist Andrew Rowe based upon the nautical and industrial heritage of his native Swansea. Most mileposts also contain a disc featuring symbols and text in code which when put together form the Millennium Time Trail. There are 60 different designs, spread across the country and they make great subjects for brass rubbing. More information on the old Time Trail can be found at https://millenniumtimetrail.wordpress.com/. Sustrans leads on the development and coordination of the National Cycle Network. The Network is a series of traffic-free paths and quiet on-road walking and cycling routes that stretches over 14,000 miles across the length and breadth of the UK. Nearly five million people make the most of this incredible Network every year. From commuters and school children to dog walkers and weekend cyclists, lots of different people, going to and from different places, use and love the National Cycle Network.